AIMS Power inverters will be at their first-ever tradeshow, the ICUEE (International Construction & Utility Equipment Expedition), October 1 to celebrate 12 years in business. 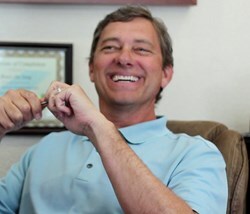 AIMS Power president and founder, Bruce de Jong, laughing during his interview for this story. “We try to balance options, weight and performance of the inverters within the product lines to optimize their effectiveness for the customer’s application."